BANGKOK, 11 September 2013 Privy Council President Prem Tinsulanonda has left Phramongkutklao Hospital after recovering from a lung surgery. 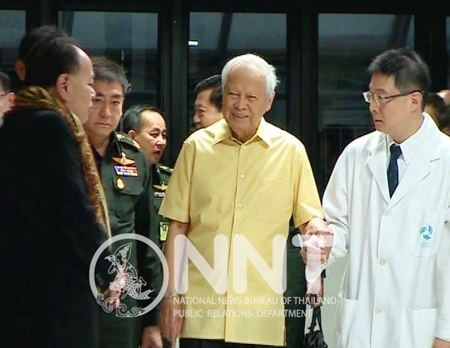 Former Prime Minister and Privy Council President Prem Tinsulanonda was released from the hospital and returned to his Sisao Thewes residence yesterday. According to his doctor, the surgery went as planned and the 94-year-old former Prime Minister is now in good condition, adding that he can talk and walk normally, and the team of doctors found no irregularities in his latest examination. Prem was admitted to the hospital for treatment for lung inflammation on August 30th. Privy Council President General Prem Tinsulanonda was born on August 26th, 1920. General Prem is a retired Thai military officer who served as Prime Minister of Thailand from March 3, 1980 to August 4, 1988. General Prem, as the Chief of the Privy Council, has been a leader in promoting King Bhumibol’s ideologies and royal projects.